Last February 2007, I was one of the lucky Microsoft MVPs in the region that was sent out to Microsoft China Technology Centre in Beijing, China for a Windows Vista laboratory. To be honest, I had a short state of culture shock in this trip. 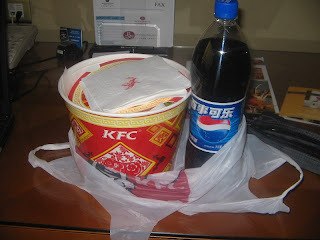 I had a lot of "firsts" in Beijing and the trip definitely stucked in my mind. It was my first time to experience cold weather. It was also my first time to travel alone in a foreign country and to add up, my first time to be in a country where English is not a major language. Not a lot of people could understand me, from ordering food in fast foods and restaurants (where I used the art of hand signals and pointing), to asking for some things from the hotel staff so I really had a hard time communicating. I arrived a couple of days early which gave me a few days to roam around, but it also meant I was all alone by myself during that time - no one to voice my frustration to. Another thing, It was my first time flying international in Business Class. First thing after I arrived, I was shocked to see a lot of people in the immigration desks. During this time, the new airport terminal in Beijing was still under construction (for the Beijing 2008 Olympics). It took me around 40-45 minutes to get through but once I was there in front of an office, the process was smooth. I braved and took a taxi cab from the airport to the hotel. I was told that the city is far from the airport and I was too cheap to take airport limousines. Good thing I printed the address of our hotel (Renaissance Beijing) in Chinese characters. I just pointed it to a driver who acknowledged saying "Xie Xie" and off we go to Xiaoyun Lu in Chaoyang District. On the way to the hotel, I have seen a couple of markers like this for the Beijing 2008 Olympics. I can safely say the city is really remodelling itself, getting read for the big event. On arrival to Xiaoyun Lu, apparently, it appears the driver have just understood that it was "Xiaoyun Lu Street in Chaoyang District" and do not know where the hotel is. He kept on asking me something I do not understand so I only replied back with "Renaissance, Renaissance" in different accents. In a few minutes, I saw the building, pointed it and I'm glad he understood my pointing (by this time, my hand signals and pointing is getting better). So I arrived at the hotel. I haven't eaten lunch yet and it's almost 3:00pm so I decided to walk around and grab something to eat. Walking around I didn't really understood what I was looking it. If it has clothes, must be a boutique shop; if it has people eating, must be a restaurant. In Beijing there are lots of people riding bicycles and I'm glad to see that there are even roads with bicycle lanes. I came across a place with lots of people shopping. I thought, maybe I could grab a bargain. Later did I realize that I actually went to a place called "Ladies Street". On a side street, I saw another Olympic monument. I thought that the China must really be looking forward to the big event. Because I didn't want to get into the hassle of communication problems again, I decided to order a bucket meal from KFC for my lunch and dinner so I do not have to go out later for dinner. Good thing there was KFC, 7-eleven and Starbucks within the vicinity, but even there communication I still practice my hand signals and pointing art. I went back to the hotel afterwards, arranged a tour for the next day, and decided to relax a bit in my room and eat my lunch (and later on, dinner). The next morning, after eating breakfast at the hotel, was my free time to tour around the city. I really am amazed to see people and bicycles criscrossing around the city. First stop was Tiananmen Square, where the Parliament House and Forbidden City is nearby. From there we walk towards the Gate of Heavenly Peace. This serves as the entrance to the Forbidden City. Inside Forbidden City, we saw vast structures that was previously accessible only to royalties (hence "Forbidden"). Before lunch, we were led into a "silk factory" where quilts are being made. It was an exciting thing to see the production line process but hey, we do not have use of these at home. We also visited the Temple of Heaven after a scrumptous lunch. After the tour, I was driven back to the hotel. The next few days will be the laboratory so I didn't had much time to go around. My roommate, from Thailand, and I decided one afternoon to make good use of the time when we ended early one afternoon and decided go to the Lama Temple. Going back to the hotel from the Lama Temple, it was my first time to see something that I also experience in Manila - bad traffic! Later that night, we decided to have a dinner to taste a famous and authentic Peking/Beijing Roast Duck served at Quanjude Restaurant, a couple of blocks away from our hotel. What I loved about the experience is that the roasted duck (with its crispy skin and juicy meat), will be cut right in front of you before serving. So this was me, sampling the duck. I never really expected I would like it. At first it was just another "roasted chicken", but I was wrong. The highlight of my sidetrips in Beijing was the day after the laboratory ended. My colleagues in the Microsoft MVP program went to the Badaling section of the Great Wall of China. It was a long drive from Beijing. 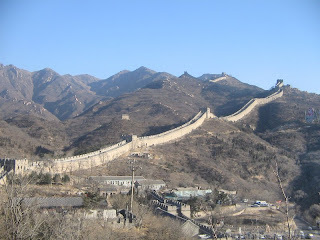 To really experience the Great Wall, we had to climb to the towers ourselves. It really was a "wow!" moment for me, like a dream come true. I never expected I'll ever be there. So I was thinking "Thanks Bill (Gates)!". The wall was also featured in a Microsoft campaign "The Wow Starts Now" where a short clip was shown where a person was awed by its amazing beauty. I have to say, climbing up in the wall wasn't easy for me. The steps are really steep, I was catching my breath, and February is a cold month in China. It was my first time to experience cold weather in zero to negative degrees celsius, and although I had headache afterwards, I am ever thankful for that experience. We went afterwards to Tiananmen Square and the Forbidden City so it was a second time for me. The group also went to a Jade factory. Overall, the experience for me was awesome. I have always been amazed by the culture and beauty of China and am very thankful to be given a chance to visit Beijing even for a short time.